Time to update your bookmarks and RSS Feeds! It's time! We have officially launched our brand new blogsite. You don't have to come here any longer, unless you really want to. We won't be upset if you want to just relive the past. So, go take a look, update your bookmarks, google reader, and RSS feeds. Stay a while, leave some comments, and keep coming back. 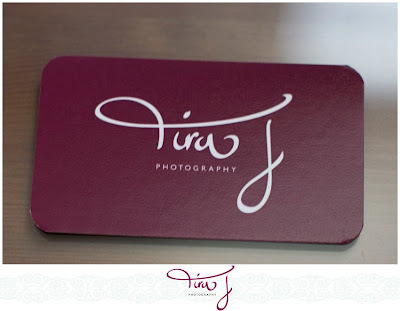 NEW OFFICIAL TIRA J PHOTOGRAPHY BLOGSITE! So long, farewell, auf Wiedersehn, good night! That is what we are about to say to this cute little blogitty blog blog! We have had a wonderful relationship, me and this black and green blogger blog. He (Mr. Blog) has been there since the inception of my photography business, has taken hits (the hit counter kind) from all of my blog stalkers, listened to your comments (thanks for the blog love), and waited patiently with you as we get ready to unveil our new online home. We are not quite ready yet, but I leave you with this great photo that my friend, Hanssie took. A few weeks back, David and I went to hang out with her so she could grab some new photos of us for our new site. I know you all have been patiently waiting, as have I. Not to worry, things are moving along nicely in regards to our website(s). I was so super excited to have received my new business cards the other day. There has been a lot of talk over the past few months about branding yourself. Let me tell you, I could write a million blog posts about branding, but I won't go there quite yet. Seriously, it has been a wonderful process, and I am so happy with the outcome. You may have noticed my new little border around the picture. Yep, get used to it, because it is here to stay, just at the new location! Never thought I would see the day when I could actually box up all of my graduate school books. I made the decision before I finished graduate school that I would not go on to get my doctorate at this time, and instead pursue my photography. Please don't get me wrong, earning my M.Ed. was a HUGE accomplishment. 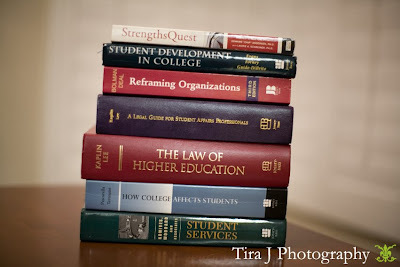 I cried a lot during the three years of the College Student Affairs program. Good tears, happy tears, and tears that probably didn't really mean anything. I would not trade the experiences I had with the 6 other women in my cohort, and the amount of knowledge we gained about higher education and college students for anything in the world. So, this weekend, I am boxing up, all of the books I poured over for 3 years. The extensive chapters I read, the papers I wrote, the capstone I created, and the memories that will forever be ingrained in my brain. Someday, I do have plans to go on and get a Ph.D. in Higher Education and to run an institution, but for right now, I am taking time to pursue what God has placed before me. The picture below are just a few of the books we spent a great amount of time in over the course of three years. It kind of makes me sad boxing them up right now, as I feel like some of those books deserve to be read again, as I can spend a lot more time without all of those deadlines on the syllabus. It was all the buzz last week in blog land, when Jasmine Star announced that she was going to do her first official workshop titled, "The Workshop". Oh my goodness. I had a feeling that something like this was going to be coming soon, she just couldn't not do something like this with her major popularity, skill, commitment, and love for the photography industry. I went straight to the website she created with Show It Sites and read all the details. It was so exciting! 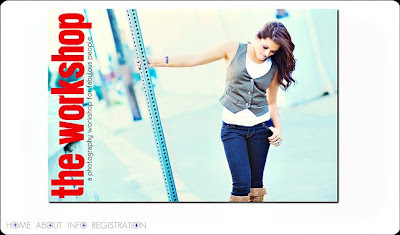 To spend an entire day with Jasmine Star and 19 other photographers who want to learn how to build their business, work on branding, and other shooting techniques. I started to send David text messages with the details and informed him that the workshop was going to be held on my Dad's birthday. He said it would be a wonderful way to pay tribute to my father's legacy in the photography business and go to Jasmine's workshop on March 10th. HOLLLAAA!! I am going and I can't wait! *edit, I haven't been "wait listed" and I am going. I get to spend the entire day with some totally fabulous people! I think with the huge response she has received from the workshop, there will be more in the near future.